MANAUS: Adventurous England World Cup fans who go to see their team play Italy in the sultry tropical heat of Manaus could come across 65 different types of snakes, but experts say the snakes have more to fear. England play Italy in their opening Group D match in the Amazon city on June 14. British tabloids have warned fans they could run a gamut of dangers ranging from criminal gangs to poisonous snakes. And England coach Roy Hodgson put local noses out of joint when he dubbed Manaus the place his time had wanted to avoid. But England's faithful can turn to a helpful guide to 65 snake species prepared by the National Research Institute of Amazonia (INPA). 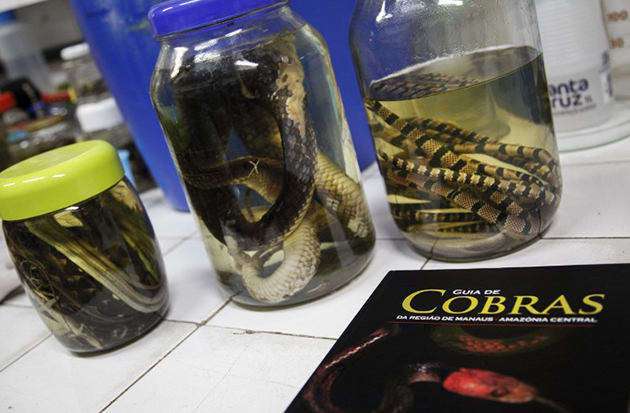 The INPA says the guide, in English and Portuguese, is designed to "demystify the poor image" people have of serpents. William Magnusson, an Australian academic originally from Sydney, worked on the guide, as did his Brazilian wife, Albertina Lima. Magnusson, 34 years in Manaus, revealed the pair soon discovered a common love -- of frogs. Lima is an expert on the topic. Has he ever been bitten? 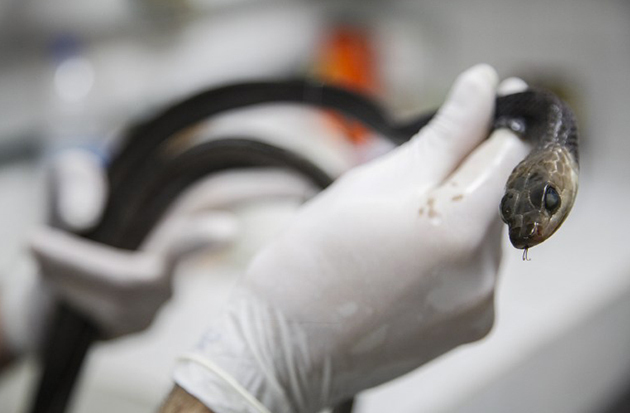 "A lancehead viper once bit me -- I was showing someone how to pick it up," Magnusson told AFP. He explained snakes in Australia are "generally shy and elusive." In Brazil many "wait to ambush predators (so) it is therefore much more likely that you will step on one. So a snake bite is a much bigger problem in South America than in Australia." Lima said snakes, and Manaus, get worse press than they deserve. "Unfortunately, we shan't have enough copies of the guide to issue them at the airport to England fans. "But it would be interesting if we could as snakes are incredible creatures," she told AFP. Noting England's one-time reputation for soccer hooliganism, she added, tongue in cheek: "Men are more poisonous and dangerous. It's them we should watch out for!" Rafael de Fraga, another guide contributor, says there are just a handful of poisonous snakes in and near Manaus. "There are five coral snakes, pico-de-jaca (bushmaster) and a jararaca (lancehead pitviper). "You can meet a few species in outlying urban areas -- mainly near forested areas where not many tourists, and certainly not the England fans, will venture. "The bushmaster can kill but it's highly rare in Manaus. I only saw one in eight years here. The lancehead can be a threat to visitors if they are intent on trekking off into the forest," he told AFP, urging people not to harm any. "Killing one is like brandishing a trophy, a symbol of machismo. They are very good at camouflaging themselves so take your rubber boots... and a good guide." 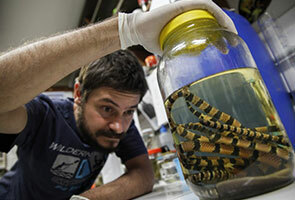 The guide itself notes that "in Brazil, few species are venomous enough to cause serious injuries and most are completely inoffensive to humans." Some 150 have been recorded in the Amazon region -- but fans should watch out if they espy a green anaconda, which can eat reptiles and even alligators. Magnusson insisted the British tabloids were wrong to suggest a snake-infested hellhole awaits fans. "It's possible a snake could bite you but highly unlikely. You could find a snake in the middle of London," he told AFP. He dubbed his work "much less dangerous than going to a football match." Snakes are absolutely not the worst thing about Manaus, say Magnusson, Fraga and Chris Westwood, a British blogger who has lived there two years. "I recommend people should be more fearful of real threats -- assaults, road accidents -- and the odd demonstration," Fraga said. Westwood said: "Any kind of snake threat in relation to Manaus I find hilarious. I've never seen one apart from in the zoo and at a little house on the river where you go specifically to hold an anaconda. "It didn't bite my head off either," he told AFP. "The principal risk to someone's safety probably comes from the roads. The quality of driving is poor." For Magnusson, "the worst thing is probably the buses -- worse than Rio!" He urged any fans who want to know their bushmaster from their boa constrictor simply to download the guide.